Cathy's research principally concerns dramaturgies of place and space. My other current research concerns gardens as spaces of performance, moving beyond the familiar image of outdoor theatre to investigate automata, hired hermits, naumachia, rituals, entertainments, performance art and much more. Gardens and performance have expressed and continue to express our relationship with the non-human, as well as with each other, through a spectrum of performance activities. I am always interested in walking performances, and am a core member of artists' collective, Wrights & Sites. Key publications include Dramaturgy and Architecture: Theatre, Utopia and The Built Environment (2015), nominated for the TAPRA David Bradby award, 2017; Dramaturgy and Performance, 2nd Edition (2016), with Synne Behrndt; The Architect-Walker: A Mis-Guide (2018) with Wrights & Sites - one of a series of published 'Mis-Guides' which provide provocations for disrupted walking. I welcome PhDs on walking art, performance and landscape, performance and architecture, Indian performance art, dramaturgy and performance writing. Personal tutees can book a meeting during Tues or Thurs 12-1. Please email to arrange. My research concerns the relationship between dramaturgies of performance and experiences of place and space. I published my monograph, Dramaturgy and Architecture: Theatre, Utopia and the Built Environment with Palgrave Macmillan in 2015. My current interests grow out of this exploration of relationships between the development of architecture and performance in modernist and postmodernist performance and out of my research into aesthetic walking (scholarly and artistic practice). I'm also interested in gardens as performance spaces, and in the ways in which gardens are structured as performances and am developing a monograph, Performing Gardens, with a focus on gardens in England, India and Japan. I am a core member of artist's collective, Wrights & Sites. One of our artworks, comprising 41 signs and titled Everything You Need To Build A Town Is Here can be seen in various locations across Western-super-Mare www.wondersofweston.org We are also known for our 'Mis-Guides' or alternative guide-books which offer strategies for making familiar places unfamiliar. In 2008 we curated 'Mis-Guided', a mini-season of artworks at the Belluard Bollwerk International Festival in Switzerland, developing ideas from a similar project for the Vienna Festival/Tanzquartier Wien in 2007. We are currently working on a new book concerned with the 'architect-walker', to be published by Triarchy Press. I am joint author, with Synne Behrndt, of Dramaturgy and Performance (Palgrave, 2008) we are also joint editors of Palgrave's 'new dramaturgies' book series. We guest-edited an edition of Contemporary Theatre Review on that topic in 2010. In 2013, I was Principal Investigator on the AHRC funded network, 'Porous Dramaturgy: "Togetherness" and Community in the Structure of the Artwork'. This project investigated the politics of work that makes the audience in some sense co-creators. I am a member of the Walking Artists Network and of the FIRT/IFTR Theatre Architecture working group. I am currently collaborating with NIAS, Bengaluru, and with MOD Institute Berlin/Bengaluru. See previous sections for a link to this project. I am series editor of Palgrave's 'New Dramaturgies' series, collaborating with Synne Behrndt, and we have collaborated in researching dramaturgy since 2005. I have been a collaborator with Wrights & Sites since 1997 - this company comprises myself, Stephen Hodge, Simon Persighetti and Phil Smith. I welcome applications from research students interested in the performance of place, space and site. Currently supervising students working in the following areas: street theatre forms in Delhi; the articulation of regional British cities in new playwriting; walking art and parenthood; stage adaptations and the street spaces of Manila, the significance of Theatre Alibi's work in schools. Aparna Mahiyaria: 'Understanding Politics, Aesthetics and Performance: A Study of the Development of Street Theatre in Delhi, India' (Co-Supervisor, Prof. Shivali Tukdeo, NIAS, Bengaluru, India). Elaine Faull: 'Theatre Alibi : An exploration of the impact on well-being and resilience on young audiences', collaborative PhD with Theatre Alibi, Exeter. Giselle Garcia: Translation, Adaptation and Walking: The Fate of Shakespearean Performance in Manila's Urban Forms. The Architect-Walker: A Mis-Guide, Wrights & Sites with Stuart Crewes, Exeter, 2018. A Mis-Guide to Anywhere, Wrights & Sites with Tony Weaver, W&S, Exeter, 2006. An Exeter Mis-Guide, Wrights & Sites with Tony Weaver, W&S, Exeter, 2003. A Courtauld Mis-Guide, Wrights & Sites and Tony Weaver, W&S, Exeter 2003. Commissioned by the Courtauld Institute for their ‘Urban Networks’ exhibition, 2003-5. 2018, curated four street-based performances in Bengaluru as part of the 'Performing the Periphery' project. 2010 Everything you need to build a town is here, with Wrights & Sites, public art commission from Situations,funded by CABE as part of Wonders of Weston (www.wondersofweston.org). 2008 Mis-Guided: Elsewhere in Fribourg, with Wrights & Sites and Belluard Bollwerk International Festival: artistic director, curator, consultant for 6 ‘Mis-Guide’ events taking inspiration from Wrights & Sites initial concept. Contribution to 'Mis-information Office' as a base for the project. Funded by BBI. 2007 Mis-Guide: Stadtverführungen in Wien, with Wrights & Sites, Tanzquartier Wien and Wienerfestwochen: artistic director, curator, consultant for 16 ‘Mis-Guide’ events taking inspiration from Wrights & Sites initial concept. Funded by TQW and the Wiener Festwochen. 2007 Possible Forests, with Wrights & Sites, Centre for Contemporary Art and the Natural World. A project involving a playful re-mapping of the forest, culminating in an exhibition and practical forum at CCANW. Funded by CCANW and Wrights & Sites. 2004 Blue Boy Walks, with Wrights & Sites, commissioned by Spacex Gallery, Exeter to accompany their ‘Homeland’ exhibition, Exeter City Centre and Winchester. 2002 And On The Thousandth Night…, improvised performance with Forced Entertainment, Kunsten Festival Des Arts, Brussels. 1999 The Quay Thing, with Wrights & Sites. A major A4E funded site-specific project on Exeter’s Quayside. 2008 Writing Space, a practical research project exploring new dramaturgical practice for work with performance writers across an expanded field. Supported by AHRC research grant (£13,000). 2007 An Infinite Line: contributor to Dramaturgical Labs which formed preliminary research for this work by Fevered Sleep, shown as part of the Brighton Festival in 2008. 1995 Platform 4. Co-produced a season of new writing, working in collaboration with Theatre Alibi. 2003 Three Writings/Wrightings – three performance-as-research projects, funded by Arts Council England and documented by Arts Archives. Air, with Dorinda Hulton and Peter Hulton, Exeter tEXt Festival; Camden People’s Theatre, London; Exeter University. I Am Going Outside And May Be Some Time, with Jane Munro, Exeter Phoenix. An Alliance, with Julia Barclay, Exeter University. 2001 Outer Space/Inner Space with Phil Smith at the Physics Department, Exeter University. Funded by NESTA, EPSRC, SWA and IOP. It toured schools in southern England. 2000 Eric’s Wasteland, Commissioned by Devon Arts In Schools Initiative, performed by and in three Devon schools. 1999 Pure Gold and Moonshine, a short play commissioned by Paines Plough, Bristol Old Vic. 1999 Chandler's Carousel, commissioned by The Common Players. Touring nationally. 1999 The Podfather, commissioned by The Common Players. Touring nationally. 1997 The Golden Fleece, commissioned by The Common Players. Touring nationally. 1997 Richard IV or The Stuff of Dreams, The Northcott Theatre, Exeter. 1997 The Man Who Would be King, The Northcott Theatre, Exeter. 1996 Northanger Abbey, The Northcott Theatre, Exeter. 1996 The Lone Rooster, The Common Players. Touring the West Country. 1996 A Savage Song, commissioned by The Common Players. Touring the West Country. 1993 Venus and Adonis, devised with Orchard Theatre. 1993 The Seven Voyages of Pericles, The Common Players, touring the West Country. 1993 Glorious Death, Produced and directed by Theatre Alibi, for the Platform 4 new writing season. 1992 The Fox's Tale, devised with Orchard Theatre. An outdoor/pub show touring North Devon. The 'Performing the Periphery' project includes elements of public engagement through curation and commissioning of locally-based artists in Bengaluru and Kochi. Further impact may arise from aspects of our research into the politics of performance - both its role in shaping narratives of place, and the impacts of urbanisation on long-standing performance practices, often involving animals. Wrights & Sites have curated work for festivals and a public art work for Weston-super-Mare. Our 'Mis-Guides' have been used in schools and colleges worldwide. Most recently, I have contributed to discussions at RAMM concerning ways of engaging children with the collections. My project on 'Porous Dramaturgy' has brought academics and practitioner-academics together with practitioners and producers outside the academy in discussions about interactivity and community. This has facilitated workshops held in Northern Ireland by project partners Tinderbox and artist Katarina Pejovic, which culminated in a workshop demonstration and discussion for an invited audience. This workshop, was partly concerned with knowledge exchange and partly brought local concerns to bear in considering and developing the research. I am beginning to develop research into the garden as a performance space. I am involved in the Little Silver/Russell Terrace Garden Project and contributed an audio-performance for that space, within the Ignite Festival, Exeter, 2013. Editor of Palgrave 'New Dramaturgies' series, with Synne Behrndt. In Jan 2015 I kept a blog on my teaching of the first year 'Research and Performance' module, in which we explored the work of the Bauhaus in 1920s Germany. It gives a good sense of the way in which my research sometimes informs my teaching, and vice versa. It includes the text of a presentation I made on this teaching work to the Prague Quadrennial in June that year, at which I was proud to show videos of the final performance. Other modules I have led or taught on at Exeter include: Theatrical Interpretation: Practitioners; Playwriting; Dramaturgy; Performance and Interpretation; Practical Essay; Theatre Praxis. This year I will be teaching Playwriting (3rd year option), Theatre Dissertation (3rd year core) and Practical Essay (Third year core). 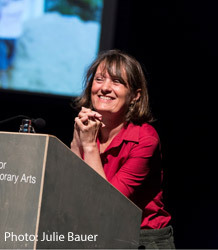 Cathy Turner is Associate Professor of Theatre and Performance at the University of Exeter. Her book, Dramaturgy and Architecture: Theatre, Utopia and the Built Environment, was published by Palgrave in 2015. She is joint author, with Synne Behrndt, of Dramaturgy and Performance (Palgrave Macmillan 2008), and joint editor, with Behrndt, of Palgrave's 'New Dramaturgies' book series. She is a core member of Wrights & Sites, a group of artists whose work is concerned with our relationship with space and place. Their most recent work is The Architect-Walker: A Mis-Guide (2018). In 2010, the company completed a major public art commission for Weston-super-Mare, curated by Situations and Field Arts and funded by CABE. She has published on dramaturgy, writing for performance, space and place and is currently researching the relationship between performance and gardens, and performance as response to urbanisation in South India (an AHRC network grant).